DADs…in all our waiting we are sometimes missing something. The present. It is great to have things to look forward to…but we need to be careful that it’s not at the expense of losing today. You know, it’s not always a bad thing to wait. Unless you are the one other people are waiting on! Wedding at 6:30. Get there early at 5:20. Sit in car. Get out casually at 5:31. Look in back seat. No coat. Less than an hour to wedding. 25-30 minutes one way! No time to discuss. If I stay, I ruin every picture. If I go they may be waiting on me! I go. I’m thinking great story later. Not now. I start calling wedding planner. No answer. On way back. 6:20. Still no answer. I’m thinking aren’t they missing me? I’m ready to be the reason the whole wedding is late. Waiting on me! I make it back at 6:34. Stop in the middle of parking lot. Told parking attendant I’m the officiant. Handed him my keys. Ran up the hill thinking I was late and would be literally walking in to start the processional. Wedding planner finally calls me as I am walking up the sidewalk towards the church…I simply say “I’m here”. Wedding doesn’t start until almost 6:50 because guests still arriving. No one even knows what happened besides me! My heart still hurts from that experience that had the “possibility” of causing others to wait. Have you ever waited for something so long…and the day came finally…and all this anticipation for the event marked on your calendar comes and goes…and it was good…maybe great…but nothing like you imagined? Even in some ways disappointing? Here is the good news, the real celebration requires no waiting, no appointment, no long lines for something eternal versus some of those things that we find ourselves waiting for, like birthdays, holidays and even graduations. You know waiting for things is just part of life. We wait for things that are important to us. Those things that are worth it to us. Like waiting nine months for a grandchild to arrive. Priceless. You know who also waits? God waits . . . He waits for people to see His glory, to admit they are lost without Him, to say yes to His love, to receive His forgiveness, to turn away from sin. While we wait for His return, He waits for our repentance. What seems to us like God’s slowness in coming is instead His patience in waiting (2 Peter 3:9). In our waiting is very little peace. And your waiting has just begun. Waiting for a raise or for the promotion. Waiting for the person in front of you to pull up and quit texting. Waiting for results from a test from the doctor, waiting one day for your kids to call. And in that waiting we grow anxious and tired because waiting for something good or bad can become a burden, but the good news is that Jesus wants to wait with you and give you His peace that only He can give. DADs, I know that your world is a battle sometimes. Right now, today and every day you are God’s precise son. I want to remind you to seek to know the truth gain all the blessings of this life, I want you to take Jesus with you. You do not have to wait alone any longer…because you have Jesus Christ who is with you even as we speak and even in the times of loneliness and heartache. The Lord is waiting to have a relationship with those He loves. And that’s you. And that’s me. He made the first move when He came to this place as a baby and then ultimately as the sacrificial Lamb. Now He waits for us to welcome Him into our lives as Savior and Lord. 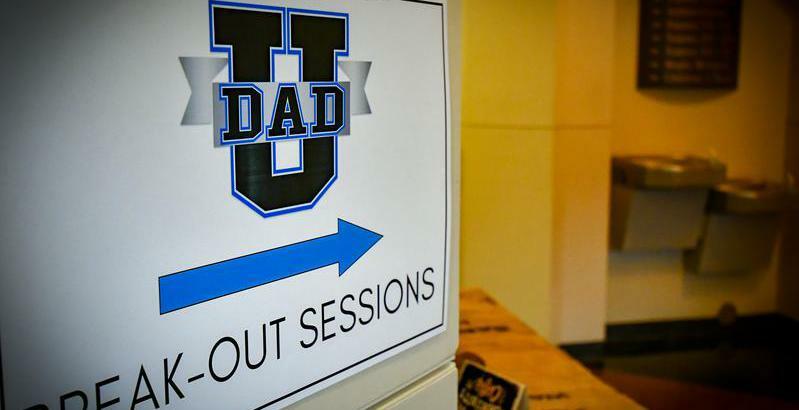 DADs…graduates of DAD U, take Him with you…wait no more. No matter where you go He is with you. Jesus is someone who will always wait and wait with you, filling you with rest and peace that only He can give. Do not wait for tomorrow to ask Him into your life. With Jesus, you are Undefeated. Thanks, be to God who gives you and me the victory.